SEATTLE, /PRNewswire/ -- A new report released today by RealSelf, the leading online marketplace to learn about cosmetic treatments and connect with doctors and other clinicians, reveals the latest annual trends related to consumer interest in elective cosmetic treatments. 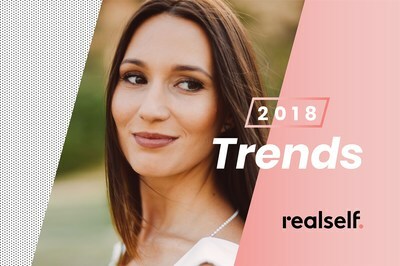 The RealSelf 2018 Aesthetics Trend Report was compiled by analyzing user behavior trends from U.S. consumers researching on RealSelf during 2018. Every year, millions of consumers visit RealSelf to research medical aesthetic treatments. Since 2015, consumer interest in minimally invasive treatments has outpaced interest in surgical treatment options, though demand for surgical procedures remains high. According to the new analysis, popular treatments like Botox and breast augmentation continue to rank among the most researched overall, however interest in lesser-known surgical procedures like buccal fat removal and new treatment solutions like microneedling and PRP therapy for hair loss is on the rise. Bellafill, a collagen-based filler and the only filler approved to treat acne scars, saw the highest growth in interest overall with a 44 percent increase compared to 2017. "Breast augmentation and Botox have been around for a very long time and both treatments have a high level of consumer awareness," said Dr. Lara Devgan, RealSelf Chief Medical Officer and board-certified plastic surgeon. "Furthermore, there has been a recent emphasis on smaller doses at younger ages, meaning that it looks more natural than in any previous era. This, along with social sharing trends, has reduced stigma and made it more mainstream." "While we continue to see high interest for surgical procedures, advancements in technology have expanded minimally invasive treatment options and helped to make aesthetics more accessible to women and men of all ages," added Dr. Devgan. "The growth of minimally invasive procedures reflects the rising interest in treatment options that deliver results with little downtime, and the trends we've observed on RealSelf indicate this demand will continue to rise in 2019." Injectables continue to be a top trend and were some of the most researched treatments in 2018, with three out of the top 10 most researched minimally invasive procedures being injectables: Botox (No. 1), Juvederm (No. 3), and Restylane (No. 9). Botox takes the top spot on this list for the second year in a row and interest increased 11 percent compared to 2017. Popular among both men and women, Botox takes the No. 3 spot on the top 10 treatment list for women and the No. 10 spot for men. Other notable changes include a rise in interest for microneedling, which jumped three spots from No. 11 in 2017 to No. 8 this year. Microblading, a type of semi-permanent tattoo that uses tiny needles to draw hair-like strokes to create the look of fuller eyebrows, fell off the top 10, dropping from the No. 9 spot in 2017 to No. 12 in 2018. Interest in surgical treatments for the breasts, from augmentation to lifts to reduction, remained high in 2018. While breast augmentation leads the top 10 list, breast reduction is also popular, coming in at No.7. Mommy makeover, a combination treatment that includes breast augmentation and tummy tuck, follows at No. 8, and breast lift rounds out the list at No. 10. Tummy tuck, which takes the No. 2 spot, also ranks high for both men and women, coming in second on the top 10 list for women and third for men. Interest in treatments that improve skin conditions—from acne to scars to discoloration—saw rapid interest growth in 2018, taking five spots on the top 10 list of fastest-growing minimally invasive treatments. The collagen-based filler Bellafill, which is the only filler approved to treat acne scars, takes the No. 1 spot overall with 44 percent interest growth in the last year. Halo Laser, a fractional laser that repairs everything from sun damage and discoloration to enlarged pores, takes the No. 2 spot with 39 percent growth. Other skin treatments making the list include microneedling (No. 5) with 19 percent growth, Retin-A (No. 7) with 15 percent growth, and Accutane (No. 8) with 14 percent growth. A growing number of consumers are researching hair restoration, with two treatments making the top 10 list of fastest-growing minimally invasive treatments. PRP for Hair Loss takes the No. 4 spot with 20 percent growth compared to 2017. The treatment, which involves withdrawing a patient's own blood, processing it so that only the enriched cells (platelet-rich plasma) remain, and injecting it into the scalp, helps to stimulate natural hair growth. Rounding out the top ten with 11 percent growth is FUE Hair Transplant, a treatment that works by removing individual follicular units directly from a donor site and then replanting them into the scalp. Topping the surgical list with the highest year-over-year growth is thread lift, which saw a 42 percent jump in interest compared to 2017. A modern thread lift procedure involves inserting dissolvable sutures under the skin to lift sagging tissue such as the cheeks, jowls, eyebrows, and lip corners. Various types of thread lifts are on the market, and each has its own technique for placement and risk of complications. Lesser-known surgical procedures like buccal fat removal and ear lobe surgery are also on the rise, with year-over-year interest up 40 and 19 percent, respectively. A slew of new technologies and treatments entered the market this year, but two stand out as the top emerging treatments of 2018. Reinforcing the overall popularity of breast augmentation, breast implant brand Motiva takes the top spot on our list of emerging treatments. Second on the list is Emsculpt, a new type of body contouring device that uses an electromagnetic field to stimulate forced muscle contractions, which cause muscle growth and fat loss. As conversations around preventative treatments and buzzwords like "baby Botox" gained popularity this year, so did millennial interest in Botox. According to RealSelf, interest in Botox is increasing the fastest among 18- to 24-year-old RealSelf users. While Botox is the frontrunner today, up-and-coming entrants from companies like Revance and Evolus could bring increased competition to the neuromodulator market. This year we saw sizable spikes in interest for nonsurgical treatments that offer a less invasive alternative to traditional surgery. The body contouring treatment Emsculpt, which ranked among the top emerging treatments of 2018, is one example. The treatment stimulates forced muscle contractions to cause muscle growth and claims to be the first nonsurgical buttock toning procedure. Another example of this trend is the off-label use of fillers. Sculptra Aesthetic, which saw 31 percent interest growth on RealSelf last year, is FDA-approved to treat facial wrinkles, but a growing number of doctors are using the injectable for buttock augmentation. Celebrities and other influencers have helped elevate the conversation and reduce the stigma around cosmetic procedures by sharing their treatment experiences on social media. As advancements in technology help make aesthetics accessible to a wider audience, more people have the ability to choose procedures that support their individuality and personal definition of beauty. RealSelf is the leading online marketplace for people to learn and share experiences about cosmetic procedures and connect with the right providers. Millions of people from around the world visit RealSelf each month to browse patient reviews, before and after photos, and medical expert answers to discover which treatments and providers live up to their promise of being "Worth It." From simple skincare to emerging nonsurgical technologies to highly considered cosmetic surgeries, RealSelf makes it easy to get the insights needed to make smart, confident decisions and find the right doctor. For more information, visit The Treatment blog or follow RealSelf on Instagram, Facebook and Twitter. RealSelf data, Jan. 2018-Oct. 2018, U.S. only.